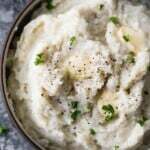 Creamy parmesan Instant Pot mashed cauliflower is a healthier, low carb alternative to mashed potatoes. Prep it ahead in the Instant Pot for an easy holiday side dish! I’m back with another healthy holiday side dish. Remember last week when I posted this Instant Pot Wild Rice Pilaf with Mushrooms and Pine Nuts? Well today, we’re talking cauliflower. Mashed cauliflower. Which doesn’t sound appetizing in the least, but trust me, it is. Especially when parmesan cheese, garlic and fresh thyme are involved. It gets so creamy, you’re going to forget you’re eating cauliflower! 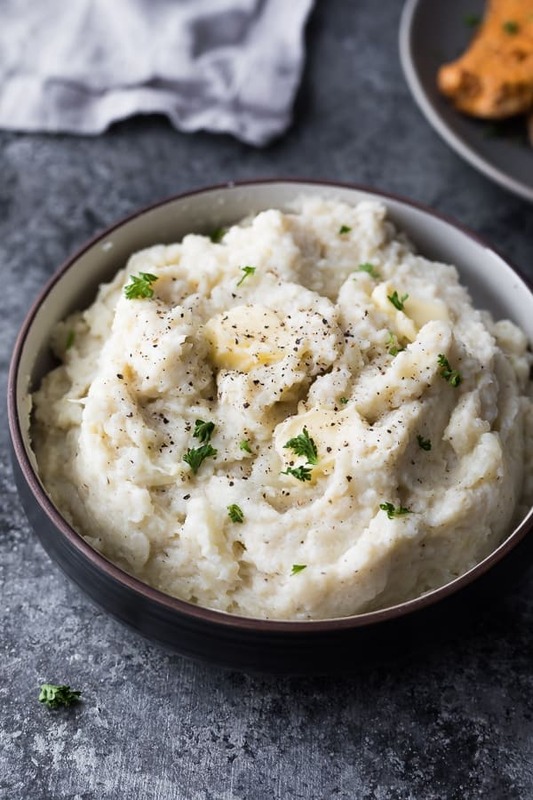 My favorite part about this Instant Pot mashed cauliflower is that you can put the whole head of cauliflower right in the Instant Pot! No need to break it down into florets. Just remove the stem and leaves and put the whole head right in! 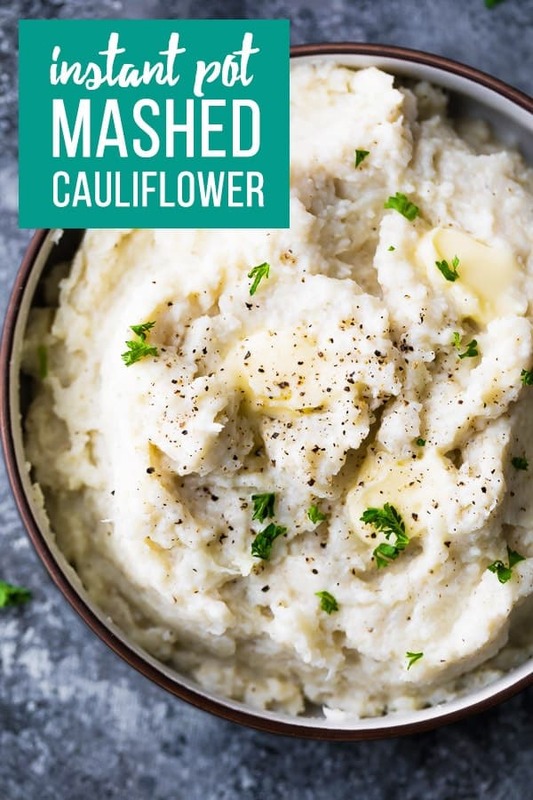 Like I mentioned above, for this Instant Pot mashed cauliflower recipe, I put the whole head of cauliflower in the Instant Pot. Because of this, it does take longer to cook (15 minutes on steam), but I just loved how hands off it is to make. 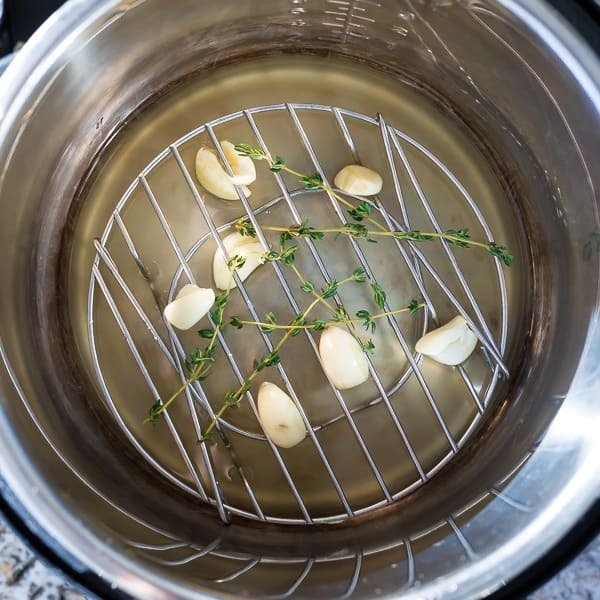 Put some stock, garlic, and fresh thyme leaves in the bottom of the Instant Pot. Can you make mashed cauliflower ahead? In a pinch: just heat it in the microwave. Keep it warm: Make it ahead and keep it warm in the Instant Pot using the ‘warm’ setting. You’ll want to keep the lid on to keep it from drying out. 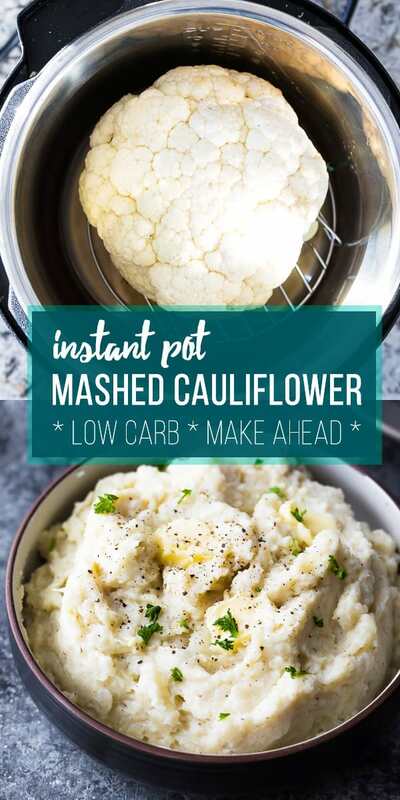 Are you looking for a stove top or slow cooker method of cooking this mashed cauliflower? Then check out this post. If you are looking to prep a bigger batch, you could cook this in two batches, or you will need to chop your cauliflower into florets. This tutorial tells you how to cook it in florets. 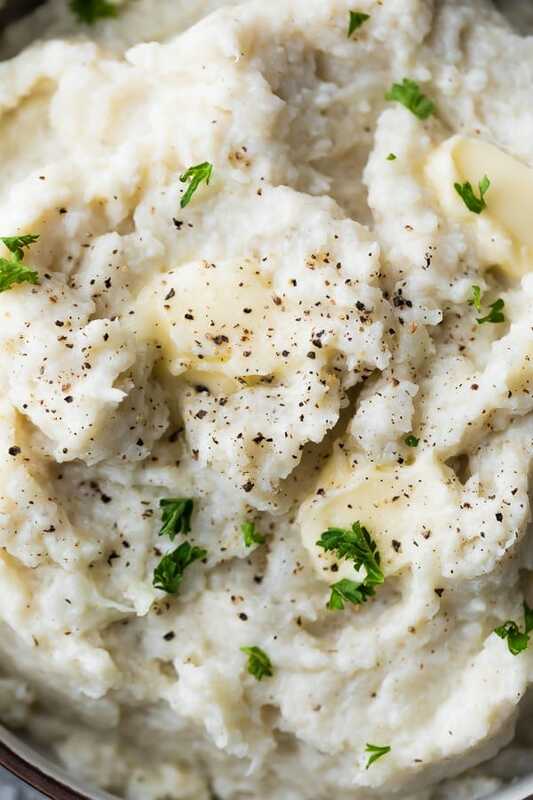 Creamy Instant Pot mashed cauliflower is a healthier, low carb alternative to mashed potatoes. Prep it in the Instant Pot for an easy holiday side dish! 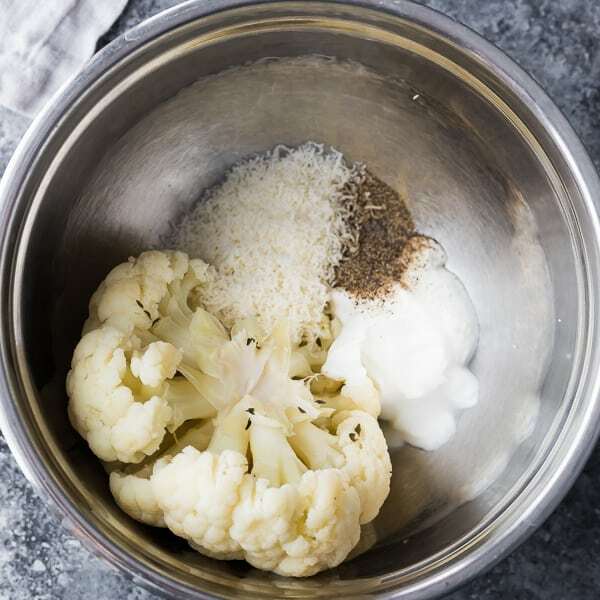 Since cauliflower sizes vary, you may need to adjust the seasoning to taste. 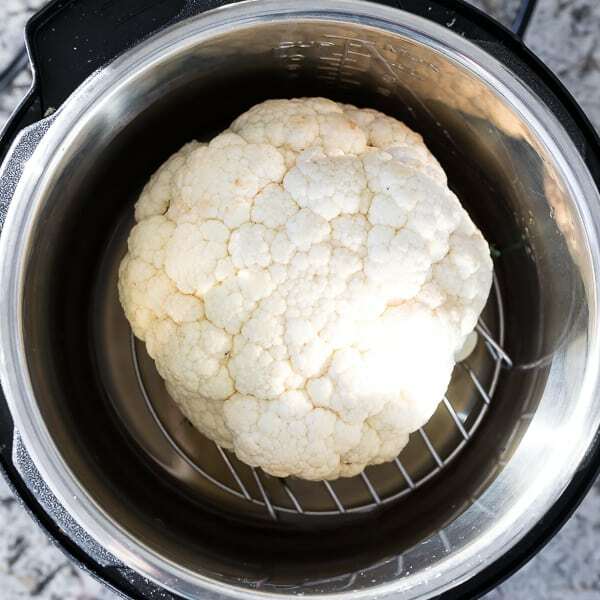 For a larger batch, you may wish to use the slow cooker version of this recipe, or work in two batches to cook the cauliflower. This looks AMAZING!!! I wonder if I can talk my family into eating it on Easter. I hope they go for it! Happy (early) Easter weekend, Suzanne! What kind of stock do you use?? Vegetable? Yes! You could use vegetable or chicken, or even water. Hope you enjoy! I’m having this wonderful dish tonight with garlic butter lemon roast whole chicken.. Thanks for sharing! Do you add in these extras to mashed potatoes too? Sorry, can you clarify your question? What do you mean by ‘extras’? Oh, so good! So filling! I didn’t have yogurt or fresh thyme, so I used sour cream and about 1/2 tsp of dried thyme. I have the QVC Cooks Essentials pressure cooker, no trivet on the bottom, and it came out perfect, although I had to make some accommodations for steaming in my pressure cooker. Definitely on the menu!! Thank you!!! So happy you enjoyed it, Barbara! Thanks for sharing your swaps and for leaving a review! I wish people wouldn’t ‘give these recipes stars for how they “look”. It is really helpful to make them and them review. How do you core the cauliflower while keeping the head whole? can this be converted to 8 quart ? if so any changes? Hi Diane! Should be no problem. Same cook time. Hope you enjoy! Regular parmesan from Italy is NOT vegetarian. It contains calf liver rennet. You need to find Italian style hard cheese and check the ingredients. Hi Simon! Yes, parmesan is (surprisingly) not vegetarian. However, I don’t believe I mention anywhere in this post that it is a vegetarian recipe? If I did could you please direct me to it so I can change it? Thanks so much! This looks great. Do leftovers taste ok? I meal prep for the week so wondering if this will work! Thanks in advance! I freeze my mashed cauliflower in little glass Pyrex dishes for a few months even. Just reheat and eat. Just made this recipe, love it! Delicious and rather simple ! The net carb count on the nutritional chart looks very high per serving. I’ve run all the numbers myself and maybe get that many for the whole batch. Am I overlooking anything?? BTW, I make a lot of cauliflower in my IP but it never even crossed my mind to put the entire head in! I’m no fan of chopping, thanks! And this sounds really tasty! Hi Belinda! I just re-ran the recipe through My Fitness Pal and got roughly the same thing…here’s the link so you can see the breakdown (these are strictly estimates, of course!). Looks like there are 30g carbs in a head of cauliflower, you could reduce this by serving smaller portions if you’d like. Well, I guess I really have never looked up cauliflower by the head! Seems like it shouldn’t have so many carbs but of course it makes sense. I’m enjoying your recipe now and it is amazing!!!! It will become a regular side with me now. Oh, I just cut mine into large florets cause I KNOW that works for me! Added probably 2T water, set my instant pot for one minute, quick release, drain and add all that yummy stuff, used my immersion blender for easy clean up. We enjoyed this! I skipped the thyme, as I don’t care for that flavor. I also cheated, and added some prepared instant mashed potatoes (about 2 servings worth) to thicken it up a bit. and stretch out the servings. Could I use frozen cauliflower instead of fresh? Hi Amy! I’m sure you could use frozen cauliflower, however I’m unsure on the cook time. You’d probably have to cut the cook time way down since they’d be in florets. I would try 3-5 minutes. Do you include the garlic and thyme in the mixture or leave it in the pot? Hi I’m about to make this!! Looks amazing ?❤️ Just a question how much salt and pepper did you add? I’m not good at calculating ? is it a tablespoon? Thank you! I love your blog btw!! ??? Hi Karla! I used 1/2 teaspoon salt and 1/2 teaspoon pepper. If you have a really big head of cauliflower you may need to increase it. Hope you enjoy! this looks delicious! 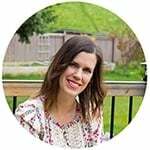 Thank you for providing a link for the non-instant pot users. I see it was originally posted 09-29-14.